During FY2017, we continued our project on Mn-catalyzed CO2 hydrogenation which resulted in publication in ACS Catalysis. In this project, we developed a simple, nature-inspired manganese catalyst for CO2 hydrogenation to formate and formamide. 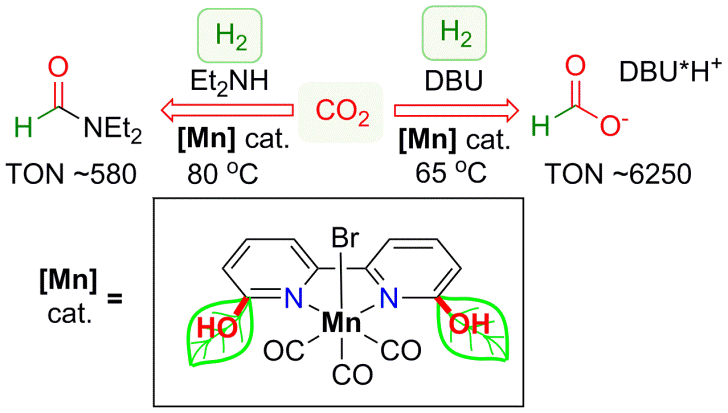 This report was the first example of the use of Mn catalyst in homogeneous CO2 hydrogenation. The advantage of this catalyst is the utilization of earth-abundant metal, manganese, and a simple and robust, non-phosphine ligand. The key to the design of this catalyst is to use a proton-responsive ligand resembling Fe-hydrogenase in nature. We also developed new ligand platforms that allow for stepwise construction and deconstruction of linear metal chains. In particular, we reported the ligands that support linear copper chains with number of copper atoms varying from 1 to 4. The formation of copper chains occurs stepwise, with the chain length increasing from 2 to 3 to 4 in a selective manner simply by controlling ligand-to-metal ratio. Moreover, we can build-down the metal chains by removing copper and shorten the chain length back from 4 atoms to 2 with high selectivity. Linear metal chains are of interest in molecular electronics and as potential catalysts for multielectron transfer. However, our study was the first report of selective construction of metal chains of variable lengths in a selective and reversible manner. The results of this work were published in Angewante Chemie International Edition. Transition-metal-catalyzed hydrogenation of CO2 and carbonyl groups to value added products has a great number of important applications in organic synthesis and energy storage since CO2 provides an abundant and inexpensive carbon source. However, these reactions mainly rely on precious metal based catalyst supported by phosphine ligands. While a few examples are known for Fe and Co-catalyzed CO2 hydrogenation, in all cases, these catalysts are supported by polydentate phosphine-based ligands. Therefore, to develop cost effective process catalyzed by earth-abundant metal supported by a simple, robust ligand is of high importance. Inspired by nature, which utilizes proton-responsive groups in secondary coordination sphere of the complex for H2 splitting in Fe-containing hydrogenases, we developed a novel Mn complex with a simple N-donor ligand, 6,6’-dihydroxy-2,2’-bipyridine, that acts as an efficient catalyst for CO2 hydrogenation to formate and formamide. We demonstrate that the presence of the adjacent OH group in proximity to the metal is a key factor to enable such facile reactivity. We were able to achieve turnover numbers (TONs) of 6250 for hydrogenation of CO2 to formate in the presence of DBU using a 1:1 ratio of CO2 : H2. Moreover, hydrogenation of CO2 to formamide was achieved in the presence of diethylamine. Figure 3: Manganese catalyst for CO2 hydrogenation to formate and formamide..
Reversible stepwise chain growth in linear Cu(I) assemblies can be achieved by using the dynamic, unsymmetric naphthyridinone-based ligand scaffolds. With the same ligand scaffolds, the length of the linear copper chain can be varied from two to three and four copper atoms, and the nuclearity of the complex is easily controlled by the stepwise addition of a Cu(I) precursor to gradually increase the chain length, or by the reductive removal of Cu atoms to decrease the chain length. This represents a rare example of a stepwise controlled chain growth in extended metal atom chains (EMACs). All complexes are formed with excellent selectivity, and the mutual transformations of the complexes of different nuclearity were found to be fast and reversible. These unusual rearrangements of metal chains of different nuclearities were achieved by a stepwise “sliding” movement of the naphthyridinone bridging fragment along the metal chain. Figure 3: Synthesis of the multimetallic complexes using naphthyridinone-based dynamic ligand platform. Dubey, A., Khusnutdinova, J., Nencini, L., Fayzullin, R. & Nervi, C. Bio-Inspired Mn(I) Complexes for the Hydrogenation of CO2 to Formate and Formamide. ACS Catalysis 7, 6, 3864−3868, doi:10.1021/acscatal.7b00943 (2017). Khusnutdinova, J. Bio-inspired Mn(I) complexes for hydrogenation of CO2 to formate and formamide, in 100th Canadian Chemistry Conference, Toronto, Canada, 2017.05.30 (2017). Lapointe, S., Khaskin, E. & Khusnutdinova, J. Synthesis and reactivity studies of bulky, electron-rich PNP ligands and their transition metal complexes, in 100th Canadian Chemistry Conference and Exhibition, Toronto, Canada, 2017.05.30 (2017). Khusnutdinova, J., Patil, P., Filonenko, G. A. & Lapointe, S. Dynamic copper(I) complexes: from sterically controlled photoluminescence to stimuli-responsive polymers, in Organometallic Gordon Conference, Newport, Rhode Island, USA, 2017.07.11 (2017). Dubey, A. & Khusnutdinova, J. Bioinspired Mn(I) catalysts for CO2 hydrogenation and transfer hydrogenation reactions, in 254th ACS National Meeting & Exposition, Washington, DC, the United States, 2017.08.24 (2017). Dubey, A. 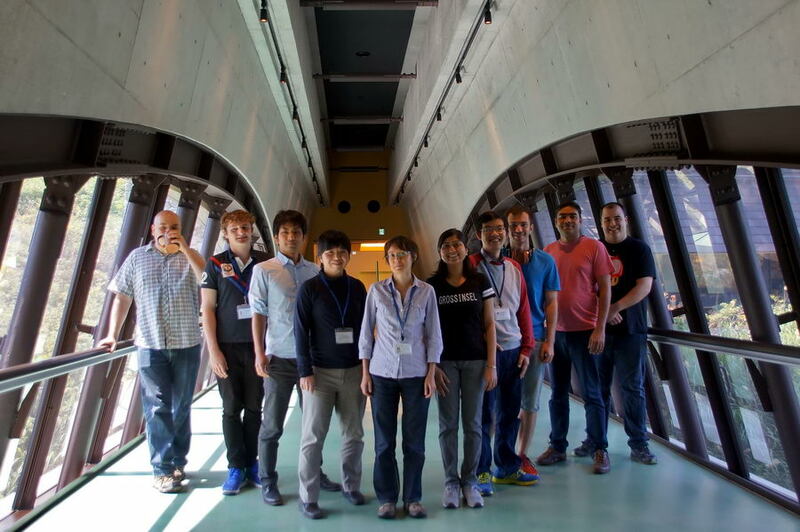 & Khusnutdinova, J. Bioinspired Mn (I) Complexes For CO2 Hydrogenation To Formates And Formamides, in 64th Symposium on Organometallic Chemistry, Sendai, Japan, 2017.09.08 (2017). Karimata, A. & Khusnutdinova, J. Utilizing dynamic properties of coordination compounds for stimuli-responsive polymer design, in The 67th Conference of Japan Society of Coordination Chemistry, Sapporo, Japan, 2017.09.16 (2017). Karimata, A., Patil, P. & Khusnutdinova, J. Photoluminescent properties of pyridinophane copper(I) complexes covalently incorporated into cross-linked poly(butylacrylate), in The 98th Annual Meeting 2018 of the Chemical Society of Japan, Nihon University, 24-1, Narashinodai 7-chome, Funabashi-shi, Chiba 274-8501, Japan, 2018.03.23 (2018). Lapointe, S., Khaskin, E. & Khusnutdinova, J. Novel bulky PNP pincer ligands: the effect on the stabilization and geometry of unusual oxidation states of Ni complexes, in The 98th Annual Meeting 2018 of the Chemical Society of Japan, Nihon University, 24-1, Narashinodai 7-chome, Funabashi-shi, Chiba 274-8501, Japan, 2018.03.22 (2018). Patil, P. & Khusnutdinova, J. Influence of Tetradentate Macroclic Ligand Sterics on the Conformational Flexibility and Photoluminescent Properties of Copper(I) Complexes, in 255th American Chemical Society National Meeting New Orleans, LA, United States, 2018.03.18 (2018). Lapointe, S., Khaskin, E. & Khusnutdinova, J. Novel bulky PNP pincer ligands: the effect on the stabilization and geometry of unusual oxidation states of Ni complexes, in The 98th Annual meeting 2018 of the Chemical Society of Japan, Nihon University, 24-1, Narashinodai 7-chome, Funabashi-shi, Chiba 274-8501, Japan, 2018.03.20 (2018). Rivada-Wheelaghan, O. & Khusnutdinova, J. Unsymmetrical Naphthyridinone-based Ligand Scaffolds for a Controlled and Reversible Stepwise Growth of Linear Chain Multi-metallic Complexes, in The 98th Annual Meeting 2018 of the Chemical Society of Japan, Nihon University, 24-1, Narashinodai 7-chome, Funabashi-shi, Chiba 274-8501, Japan, 2018.03.23 (2018). 1. "Development of Synthetic Reactions Using Transition Metal Anionic Complexes as the Key Intermediates"
2. "Main group compounds for bond activation and catalysis"
3. "Absolute Asymmetric Synthesis – Chance and Imminence"
4. "Synthetic Metalloproteins as Biohybrid Catalysts"
6. "The Efficient Outer Sphere Hydrogenation of Carbonyl Containing Substrates: Some New Insights." 7. "Catalytic Hydrogen Management of Renewable Chemical Feedstock: Hydrogenation under Dark and Dehydrogenation under Light"